I wrote yesterday about a lapse in judgement where my knitting is concerned. Here's the second part to those delusions. Looking at where we are on the calendar, it's just not going to happen. As crazy as I was to make these plans earlier this year, I'm not actually insane. I've narrowed the list down to the ones I really really wish, I could finish. Who knows, I may be able to figure out how to knit in my sleep (Without purling. That's a whole other story), and I'll have no problem getting them all done. It's doubtful though, so I'll just continue with my current plan, and see if I can wiggle another one in before the season is over. 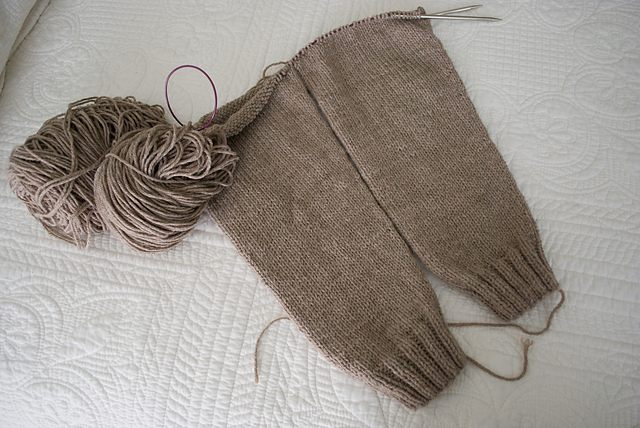 I'm currently working on the Brownstone pullover in Berocco Vintage. I really really want to get this done before the temperatures drop. I'm modifying it for a set in sleeve, instead of the raglan. My husband prefers them, and I think they look better too. The Saddle shoulder isn't going to make the cut this year.... Tough luck, maybe next time, big guy. The Linney....probably my favorite of the bunch. I can't tell you how badly I want to have this sweater for the winter. It is so totally and completely me. This will be the one I really concentrate on if I can get through everyone else's. The Pomme de Pin feels like more of a transition garment for me. I would really love to have it ready for the fall, but spring may have to do. The Amiga is already underway. I think it'll make a fantastic spring/summer-nights-in-the-air-conditioning cardigan, so I'm going to cut myself some slack on this one. I can work on this after the new year, and wear it in the spring. You know, that season here in Florida that lasts about 5 minutes before the sun descends on us, and we settle into another 9 month summer. The Gnarled Oak is a truly beautiful sweater, but the yarn I started using is trying to murder me, so it's not happening any time soon. Now this is the hard part. I don't know what it is, but something won't really let me knit any sweaters for myself, until I have everyone else covered. I keep feeling the pull to go and knit on one of the projects for the kids or my DH. Some kind of nurturing mom thing that wants to make sure my kids/husband are snuggly first? I don't know. Whatever it is, it's driving me nuts. Not because I'd rather be knitting for myself or anything. I LOVE knitting for the kids and my hubby. I think it's because I'm pretty sure, with all the other "plans", I won't end up with enough time to finish anything for myself. I guess we'll have to see how well I can manage that sleep knitting thing. Oh, and while I'm on that.... I can usually tell that I must have fallen asleep in the middle of knitting something. The way I can tell, is that for some reason, I start purling as I drift off to sleep. Whenever I pick up my knitting, and there are all kinds of unexplained purls, I know I probably fell asleep knitting again, and like a good knitter, I finished my row.